Further to considerations of simony, syncretism and sacred service in the Tercentenary of English Freemasonry to be hosted by Canterbury Cathedral on Saturday 18th February, published below is the Order of Service for that celebration. It is secret (or was). It arrived by magic (not black), but is being made public in the interests of openness and transparency: there’s nothing worse for feeding occultic hysteria than the mystery and secrecy of “Cathedral closed.. for a private service”, when the means of that ‘private’ and the content of that ‘service’ are causes of spiritual tension, if not theological contention. 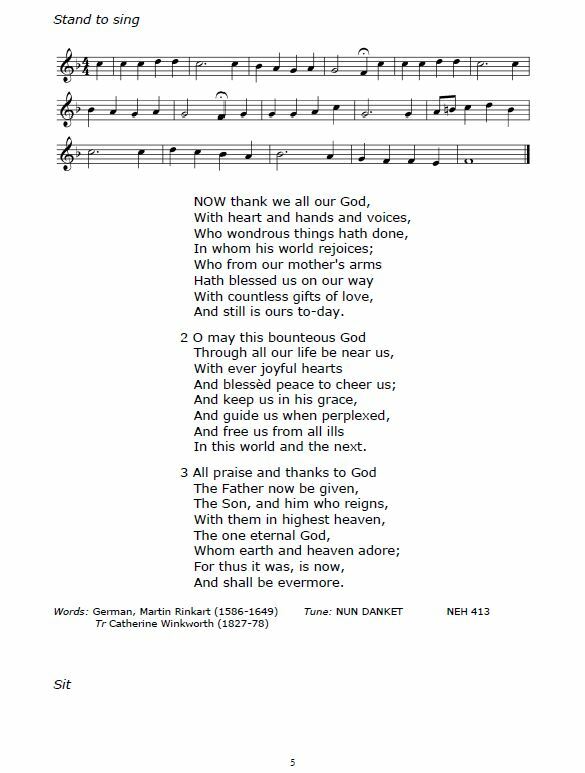 The Service has been prepared in conjunction with the Dean of Canterbury Cathedral, the Very Reverend Dr Robert Willis, who has kindly agreed to deliver the Sermon on this occasion. 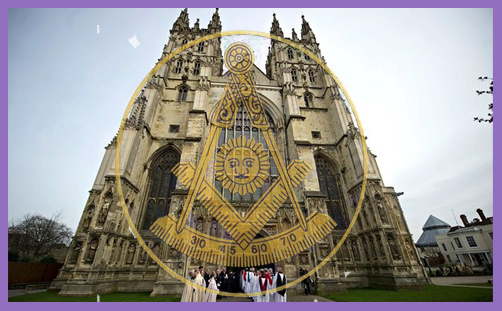 We shall be joined by several of the High Rulers in the Craft and the Holy Royal Arch Chapter together with Brethren from the Provinces of East Kent, West Kent, Surrey and Sussex. ..it will come as a relief to note that there no invocation of Jahbulon, no perambulation around the points of a compass toward enlightenment, and nowhere is the congregation asked to sing ‘Praise, my soul, the King of heaven’ with a rolled-up trouser leg and a noose around their necks. 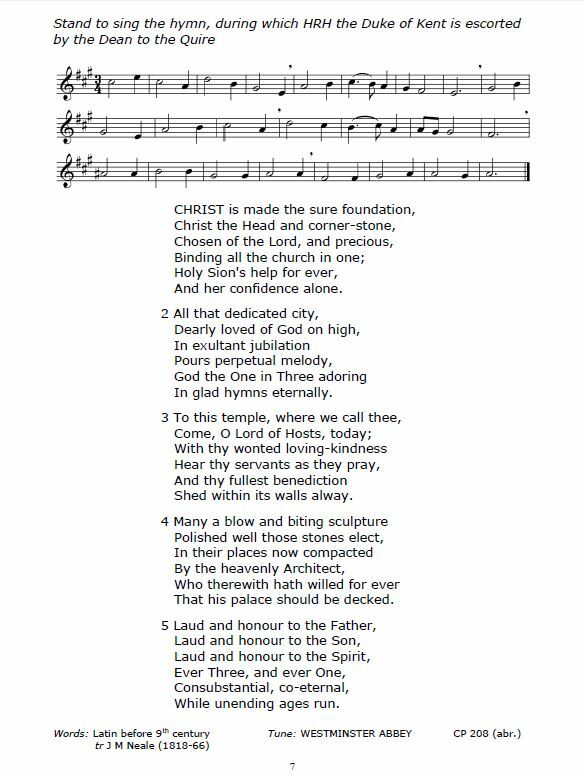 Indeed (for those who quantify these things), Jesus is mentioned eight times, Christ 10 times; the Holy Trinity is lauded “To Father, Son, and Holy Ghost”, and God is “our rock and salvation”. 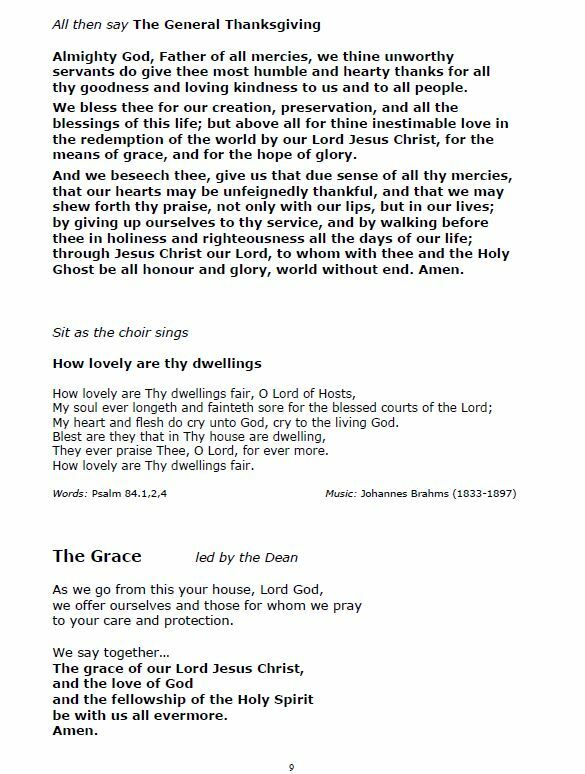 We can’t know what the Dean will say in his sermon (which is unlikely to be made public) but, on the face of it, this is a wholesome Anglican service of orthodox Christian liturgy. But here’s the interesting thing.. 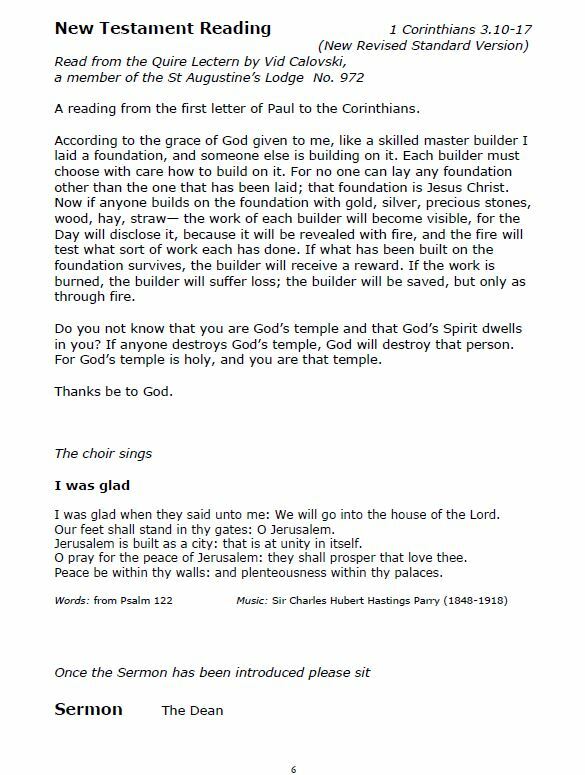 The scriptures chosen have greater significance (and a very different meaning) to Freemasons than they do to (other) Christians. Indeed, they are used at the highest degree of Masonic initiation in their rituals of exaltation. Mr A.B., a poor Candidate in a state of darkness who has been well and worthily recommended, regularly proposed and approved in open Lodge, and now comes of his own free will and accord, properly prepared, humbly soliciting to be admitted to the mysteries and privileges of Free­masonry . He is then perambulated in a clockwise direction around the Temple, from the darkness of the North toward the light. 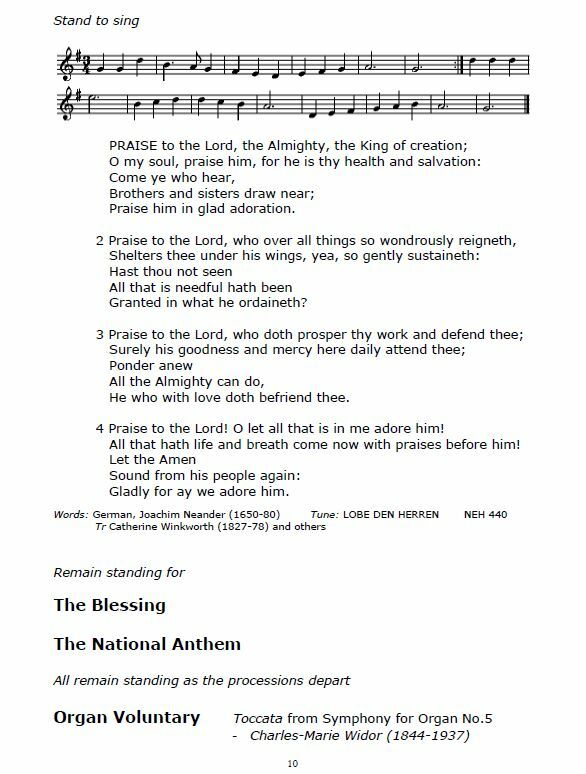 The psalmist’s ‘Walk about Sion‘ is linked to this rotation. 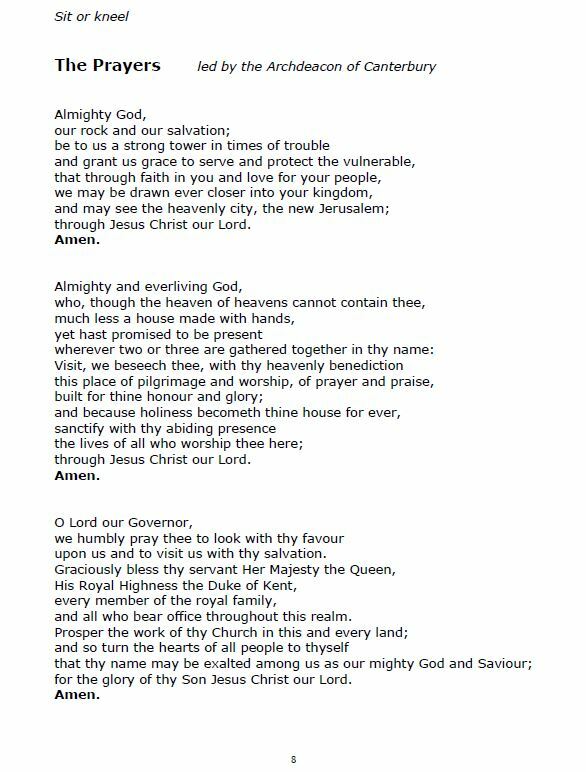 Thus is the north-side, the city of the great King, presented as the place of darkness, from which the candidate moves toward true enlightenment about the nature of the “Almighty Father and Supreme Governor of the Universe” (and note the third prayer led by the Archdeacon begins ‘O Lord our Governor’, a very particular translation of Psalm 8 drawn from the BCP 1689). ..The three great pillars supporting a Freemason’s Lodge are emblematic of those Divine attributes, and further represent Solomon King of Israel, Hiram, King of Tyre and Hiram Abif. Q – Why those three great personages? A – Solomon King of Israel for his wisdom in building, completing, and dedicating the Temple at Jerusalem to God’s service; Hiram King of Tyre for his strength in supporting him with men and materials; and Hiram Abif for his curious and masterly workmanship in beautifying and adorning the same. The characters, King Solomon, Hiram – the King of Tyre and Hiram Abiff are all taken from the Scriptural account of the temple building. 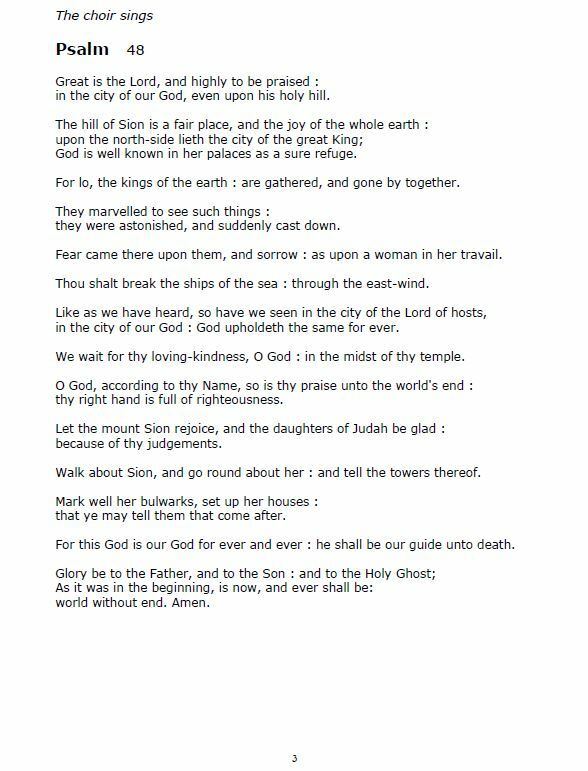 King Solomon and Hiram King of Tyre are mentioned many times in the Scriptures, such as in 1 Kings 5. 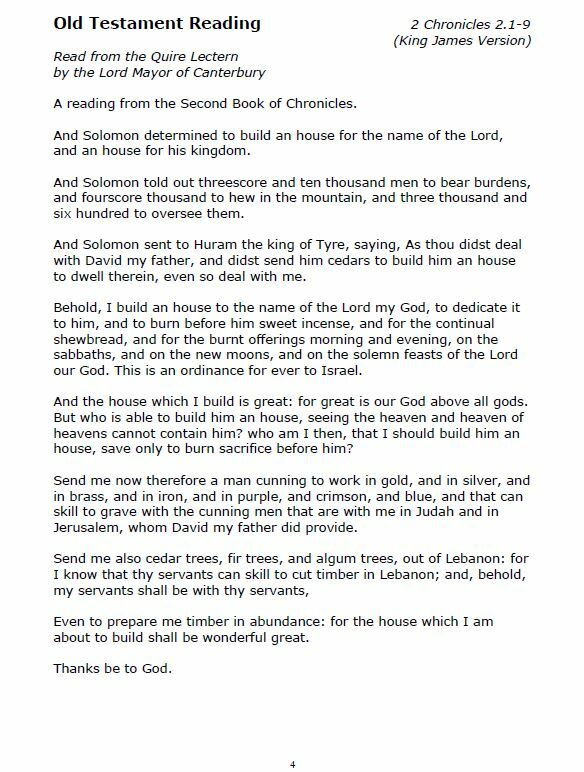 About the closest the Scriptures come to Hiram Abiff is Huram-Abi which is found in 2 Chronicles 2:13 in the NAS and NIV translations. Huram is a variant of Hiram. In the KJV translation of the verse, the name Hiram is found. The KJV uses both Huram (2 Chron 2:3) and Hiram (1 Kings 5) to identify Hiram the King of Tyre. The KJV translation of 2 Chron 2:13 does not contain -abi, but rather “Huram my father’s.” The Hebrew word from which the KJV “father’s” was translated is “‘ab,” according to the Hebrew Dictionary found in Strong’s Concordance. Strong’s entry for the word ‘ab (H1) indicates that it can also mean father-less, as the son of a widow would be. The entry for H1 also mentions “Abi-.” Studying the various translations along with a Hebrew dictionary allows us to see how Freemasonry may have settled on the name Hiram Abi-ff, also sometimes spelled Abif. There’s a lot of other stuff all over the internet on the legend and drama of Hirem Abif(f), but the provenance isn’t always clear. It is sufficient for the purposes of this post to note that the inclusion of the 2 Chronicles account is an allusion to the “Divine attributes” of the Solomon-Huram-Hiram trinity, who represent “Wisdom, Strength, and Beauty”, represented and celebrated in the classical orders: Ionic, Doric, and Corinthian (hence the Freemasons’ sponsorship of apprentice stonemasons). It is customary at the erection of all stately and superb edifices to lay the first or foundation stone at the North East corner of the building; you, being newly admitted into Masonry, are placed at the North East part of the Lodge, figuratively to represent that stone: and from the foundation laid this evening may you raise a superstructure perfect in its parts and honourable to the builder. First, the ready compliance of Abraham with the will of God in not refusing to offer up his son Isaac as a burnt sacrifice, when it pleased the Almighty to substitute a more agreeable victim in his stead. Secondly, the many pious prayers and ejaculations of King David, which actually appeased the wrath of God, and stayed a pestilence which then raged among his people, owing to his inadvertently having had them numbered. 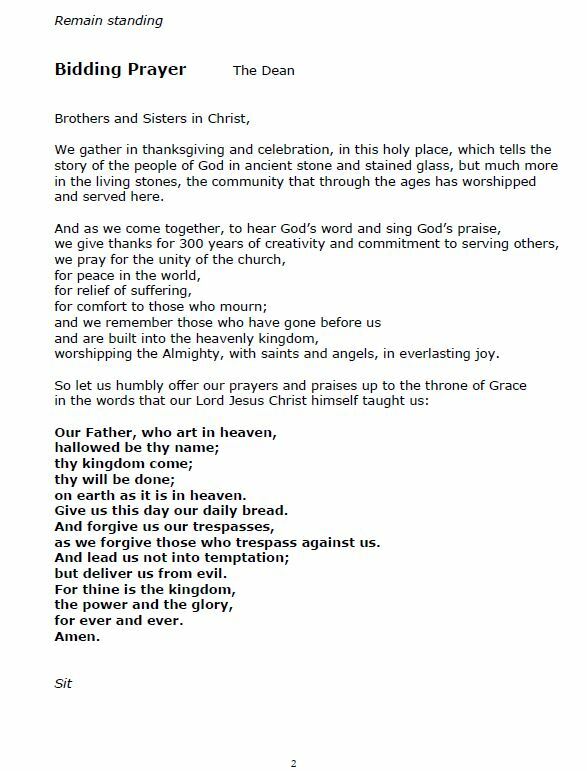 And thirdly, the many thanksgivings, oblations. burnt sacrifices, and costly offerings which Solomon, King of Israel, made at the completion, dedication, and consecration of the Temple at Jerusalem to God’s service. Those three did then, do now, and I trust ever will render the ground of Freemasonry holy. Q – What do you learn by being a Free and Accepted Mason? A – Secrecy, Morality, and Good Fellowship. There’s nothing wrong with morality and good fellowship: these are virtuous Christian pursuits. 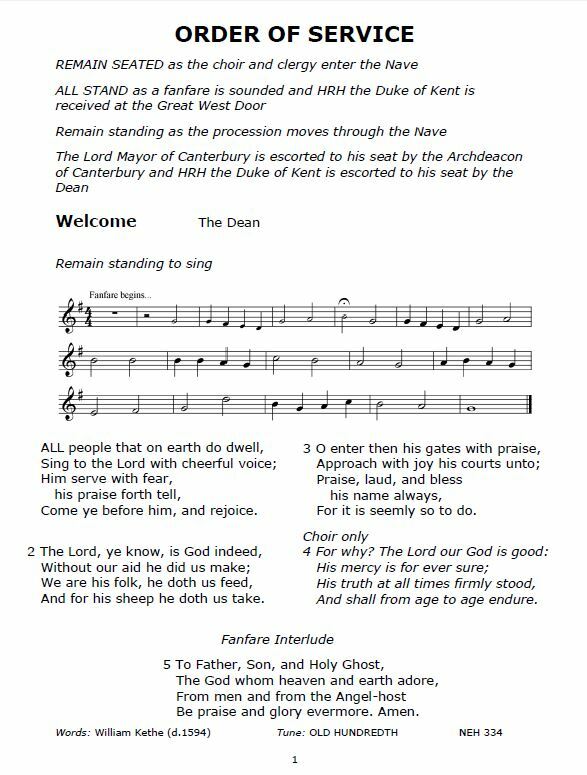 But we might well ask the Dean of Canterbury Cathedral why so much of this Order of Service is steeped in covert references to Masonic ritual, with twisted scriptural interpretations known only (now not quite) to the initiated? Why the secret syncretism?